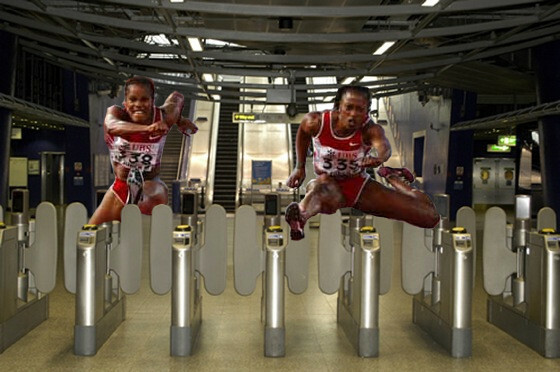 The RMT has rejected the latest Olympics pay offer from London Underground and are now stepping up the pressure for what they believe to be a fair deal for all staff rewarding the additional work load their members will need to do throughout the London Olympics and Paralympics 2012 Games. 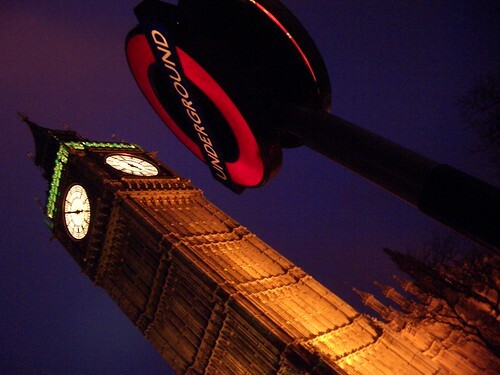 The "slightly improved" offer from London Underground was rejected because it didn't address most of the union’s reasons for rejecting the earlier offer. RMT stated the money on the table was not enough, they weren't happy with the shift payment increases and believe the offer doesn't reward staff for their work during the run-up to the Games. RMT General Secretary Bob Crow said: "RMT is rejecting this latest Olympics and Paralympics pay offer from LUL and we will be meeting with the company again to press our case for a flat rate, across the board payment which recognises the contribution of all staff throughout the high pressure extended Olympics and Paralympics period and which is free from a whole barrage of strings and caveats. “Other employers, notably London Overground, Network Rail and most recently DLR, have come up with serious offers and agreements and we expect London Underground to do the same. “It is well documented that transport will be the biggest logistical challenge throughout the Olympics period with massive pressure on staff and services from moving millions of extra passenger journeys around Greater London and the South East. 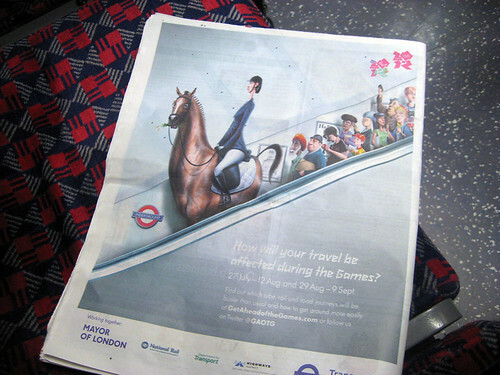 This news is pretty bad timing for London Underground as TfL have just launched a campaign called ‘Get Ahead of the Games’ to ensure that tourists, Londoners & commuters can effectively plan their journeys during the Olympic Games. 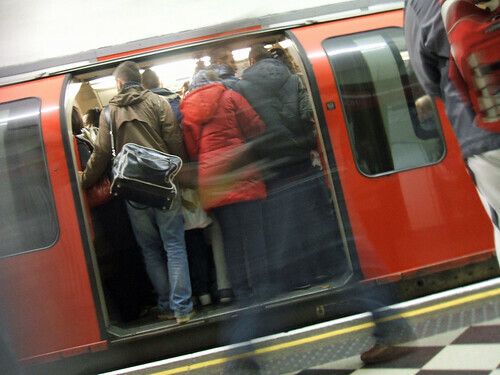 Let's hope a potential Tube strike is one of the things taken into account in helping people plan their journeys. 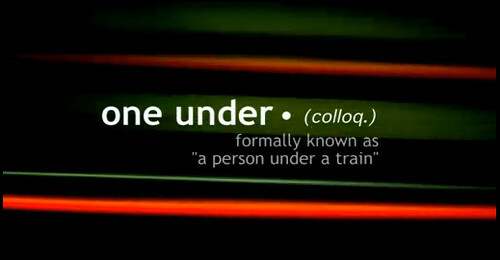 This Thursday 2nd February 2012 at 10pm, Channel 4 are airing a new documentary of inside stories from London Underground staff - Confesssions from the Underground. "I am working on a drama-documentary for Channel 4 which is looking to investigate the stresses and strains on the transport sector, in particular, the London Underground and the capital's railways. I was very interested to read your blog Going Underground and, in particular the correspondence you have with some Tube drivers themselves. 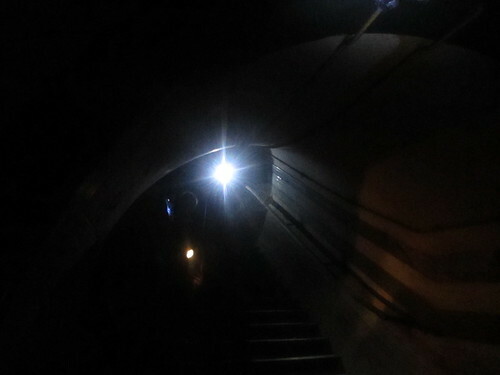 Our initial focus will be on case studies of the workers themselves, and I would appreciate any help you can give me in locating such individuals who can speak about their experiences working on the Underground. All conversations will be completely confidential and just for background research at the moment." I was asked not to blog about this at the time, so fired off some emails to some Tube staff I know and asked if they could help. I also pointed the production company in the direction of some forums and other Tube blogs who may have been able to help. 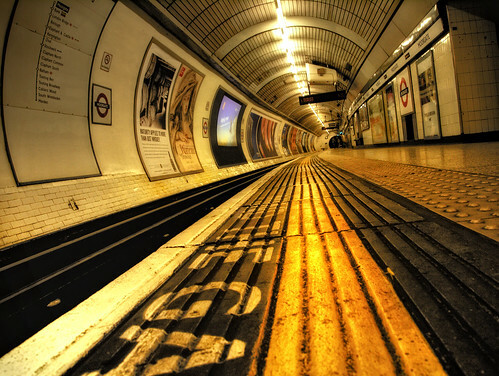 The documentary gives the inside story about parts of the Tube network we don't see. "workers reveal the dilemmas and pressures that they must reconcile to keep this hugely complex and strained system running. 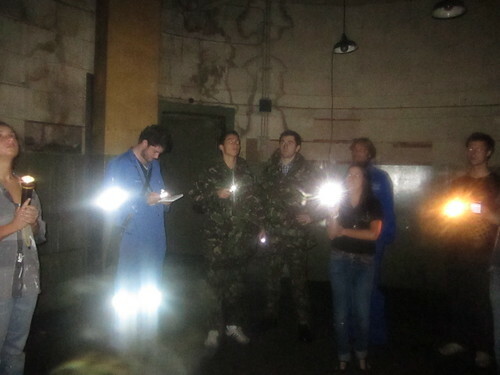 Actors voice the precise words of the workers: train drivers, maintenance workers, station staff and controllers. They negotiate the difficulties of storing dead bodies after suicides and the hazards of fixing signal failures within an ageing infrastructure. They confront aggressive passengers and emergency incidents and try to make sense of a bewildering array of procedures and targets." I'd like to thank the Tube staff that helped out. You know who you are. It was interesting that Rare Day & Channel 4 chose this approach of using actors to voice the thoughts rather than real staff themselves. I also got a few responses back to my initial email where I really had to reassure the staff that their real names would not be used. I'm intrigued as to what we will discover. Looks like there will also be an answer to that age old question "Ever wondered why you've heard a 'good service' announcement over the tannoy even when you've been stuck on a train for the past 10 minutes?" Update: 1st February - TfL's press office have been in touch with me and have said that they will be watching with interest as the producers seem to have taken a highly selective and partisan approach. 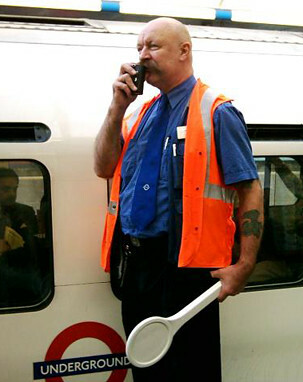 They say that the film-makers and Channel 4 were given numerous opportunities to put their claims to London Underground’s Managing Director Mike Brown directly, including an interview on camera but flatly declined, "preferring to base their programme on claims that they were either unwilling or simply unable to substantiate." Update - 2nd February 9am - One of the first national dailies to review tonight's show is The Daily Telegraph who did give TfL the opportunity to respond. They focus on the dead bodies stored in cupboards story. 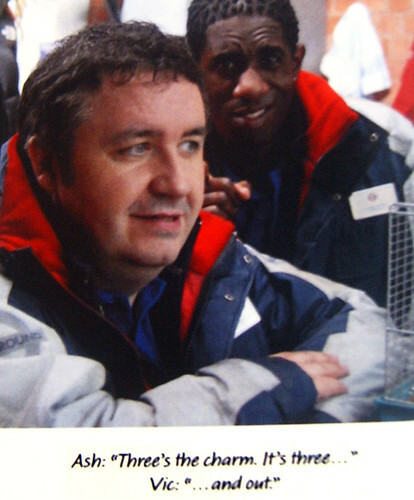 "One male member of the Tube’s Emergency Response Unit said leaving bodies in cupboards was very disrespectful. He told Channel 4’s Confessions from the Underground: “As far as I understand it, London Ambulance services have limited resources and a few years back they stopped taking anybody who’s deceased into their ambulances back to hospitals". Dogs on the London Underground. 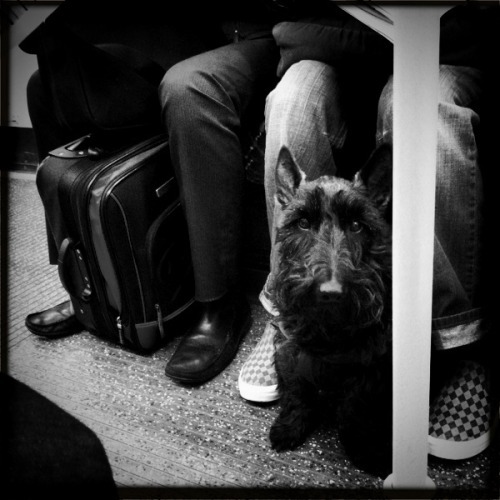 I'm a big fan of dogs and love how they travel on the Tube, they're curious but usually quite calm. The polar opposite of how a cat would be when travelling by train. 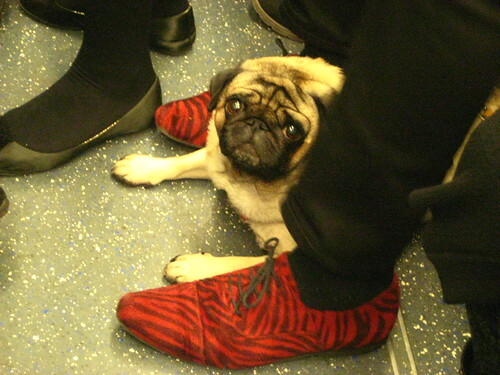 So I was delighted to discover a new Tumblr blog simply called Dogs on Trains. The premise is simple, if you've seen a dog, whilst on a train, take a photo, send it to Ellen Munro or Tweet her the link at @dogsontrains & she'll put it on her site with a suitable caption. 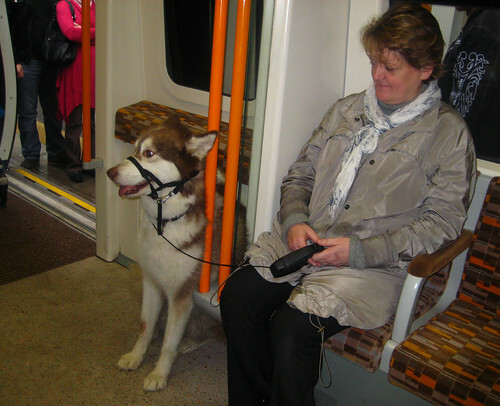 This one was not on the Tube but huge husky type dog I saw on the London Overground. Ready for this one? 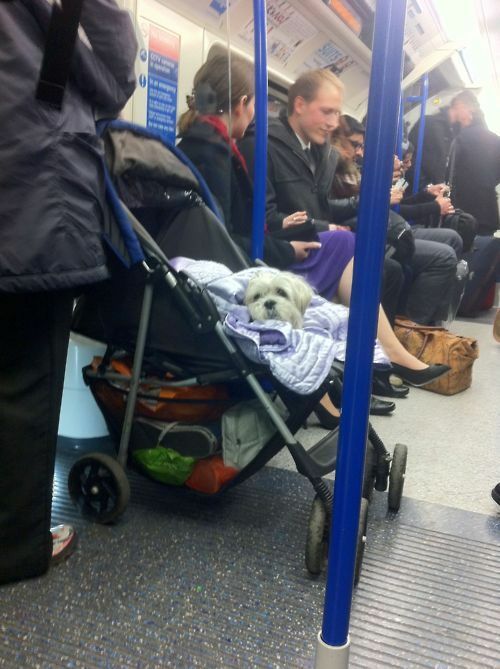 A DOG IN A PRAM. No, really. Seen by Ann-Marie James on the Victoria Line, London. The whole site is strangely compelling & if you like dogs (and trains I spose) Dogs on Trains is a lovely place to visit. He asked if there were any more like this. I thought there were. Certainly reminded me of some stickers I saw in "Look Mum No Hands" and a quick(ish) Google search revealed they do indeed have them. As well as "Danger! 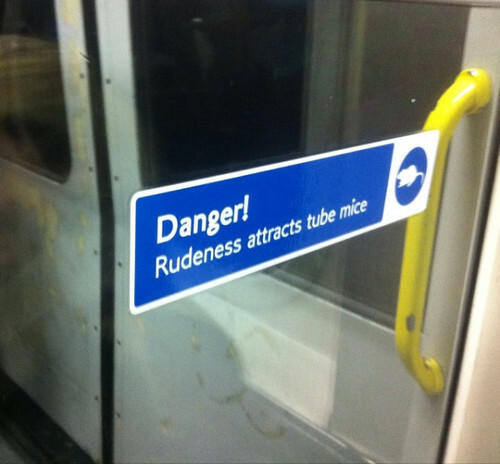 Rudeness attracts Tube Mice", there's also Cheer Up Tube stickers for "Frowning on a Friday - Strictly Forbidden", "Fixed Penalty, All Sweeties must be shared & Chocolate" and "Loud music prohibited - Unless you sing along too". For £2 for a pack of five they're a bobby bargain! 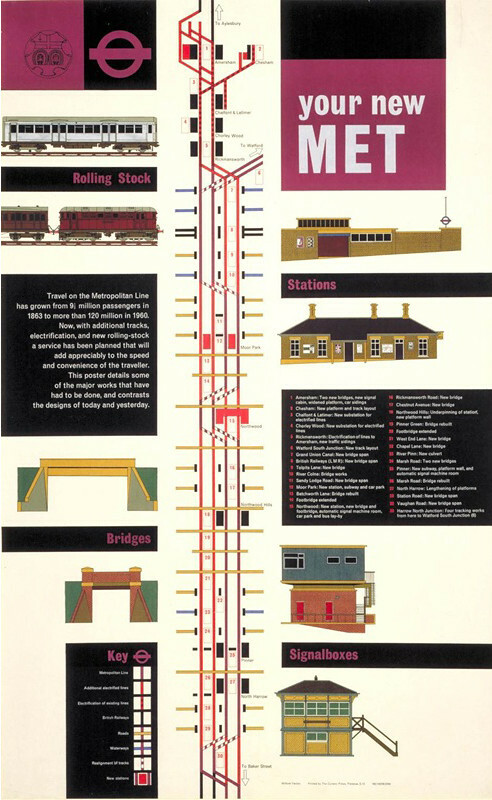 Not exactly an infographic but interesting historical new poster of the 1960's Metropolitan Line extension from London Transport Museum. It's a reproduction of a 1960's poster that introduced the newly modernised Metropolitan Line 50 years ago, with the "new" extension. 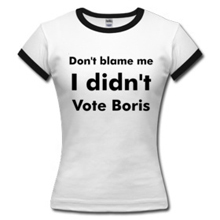 It's £9.95 and available online here. And for those who are old enough, you might remember the iconic Metropolitan line trains with their high back seats and commodious luggage racks. London Transport Museum have rescued a limited number of these original 1960's luggage racks from decommissioned Metropolitan Line trains. You can buy them online from £150 or at the Museum’s Covent Garden shop from March 2012. 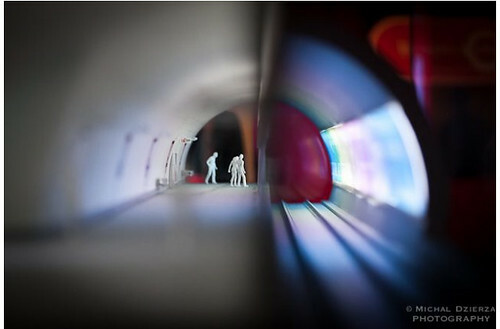 During Michal Dziera's visit to London Transport Museum last Friday at the Sense The City Photo exhibition he spent some time photographing the fascinating world of miniature London Underground stations and tiny commuters. He said: "It all looks rather eerily empty and Alien-like, although if my commute every day was that comfortable, I really wouldn’t mind." You might have read a number of reports about the "Leaning Tower of Big Ben" after MPs became concerned that the landmark clock tower is tilting. The 96-metre tall clock tower, which houses the bell, nicknamed Big Ben, leans about 46 cm to the left of its peak. 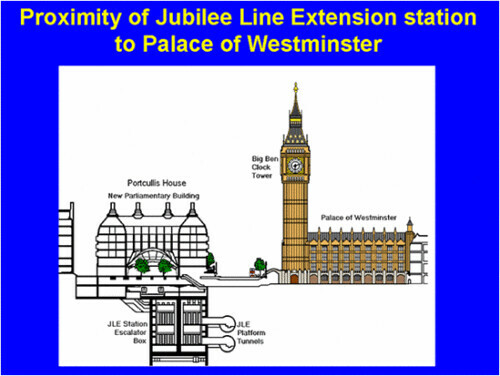 Professor John Burland of Imperial College London said work on the London Underground Jubilee train line in the 1990s had not caused dramatic movement, while a spokesman for The House of Commons commission said the tilt could have existed since its construction in 1859. The lean is just about visible to the naked eye and as John Burland told Radio 4 Today show yesterday, had "been there for years". Burland said "When I first started work on the car park it was obvious that it was leaning. It was probably developed at a very early stage because there's no cracking in the cladding and we think it probably leant while they were building it and before they put the cladding on. "There's no such thing as an old building that isn't cracked. 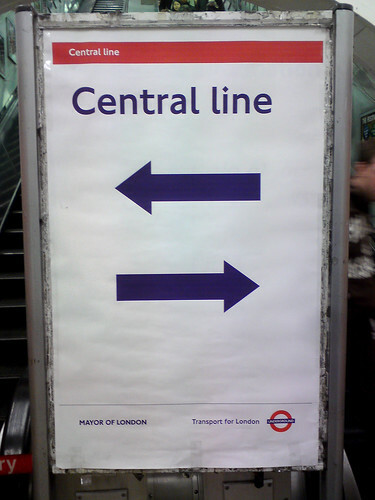 In fact they're beneficial because the building moves thermally more than is caused by the Jubilee Line and the movements concentrated around the cracks and, if they didn't, there'd be cracking elsewhere. 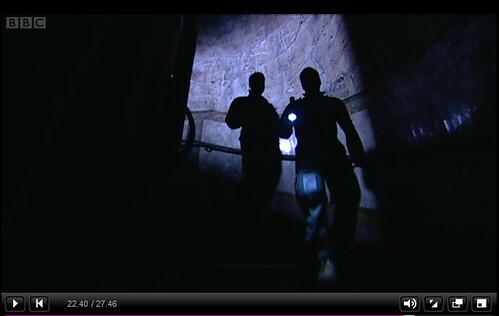 Ianvisits has a great blog post from a number of years back about the Jubilee Line tunnels under Big Ben's clock tower. 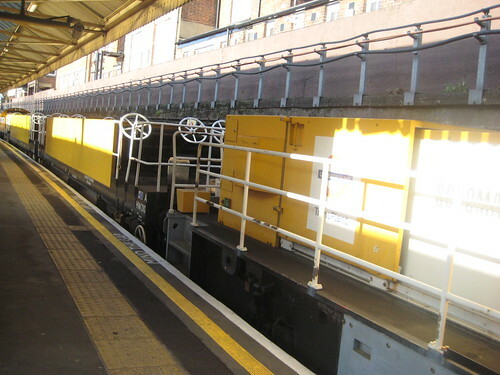 He wrote "As a Jubilee Line tunnel was tunnelled by the tunnel boring machines (TBM), despite the best efforts of the workers, there is always a slight gap between the tunnel wall and the soil outside, leading to some subsidence at ground level. The gap is only a few millimetres, but when amplified around the entire tunnel diameter, that actually adds up to quite a bit of missing soil, and can cause significant problems. Before work starts on any tunnel now, ground surveys and measurements are taken to calculate the subsidence risks and effects on buildings." "The big risk, which was gleefully latched onto by the news media was that the tower would start to lean sideways towards the tunnel work and may even start to develop cracks or damage. As the TBM worked its way through Westminster, electronic monitors on the tower checked how far it was starting to topple, and then pumped grouting into the soil to basically push the tower back upright again." His post has more pictures of the compensation grouting work ( from a talk on tunnelling by the Royal Society) which was only carried out at night. He concludes "Without compensation grouting, it is expected that the tower would have tilted by some 10cm at the top – which would have been obviously unacceptable." No this isn't a spoof. Lord Toby Harris believes that Boris Johnson should consider a rejected e-petition made to the Government to "improve “the flow of passengers through busy London Underground stations” by installing slides in place of escalators." Lord Harris (@LordTobySays), who chairs the All-Party Parliamentary Group on Policing and is Treasurer of the Parliamentary Information Technology Committee said "The e-petition has been rejected because this is a matter for a devolved authority – in this case the Mayor of London – and therefore it is for the Mayor of London to consider this proposal." 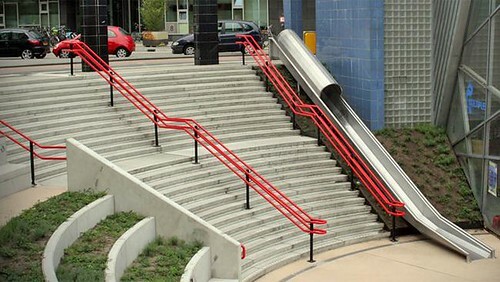 A prototype has already been tried out in Berlin and proved popular with more people choosing the slides than the escalators or stairs. Also commuters in Holland can take the newly installed "transfer accelerator" to quickly descend the station stairs at Overvecht Station and access platforms. Come on Boris, what are you waiting for? 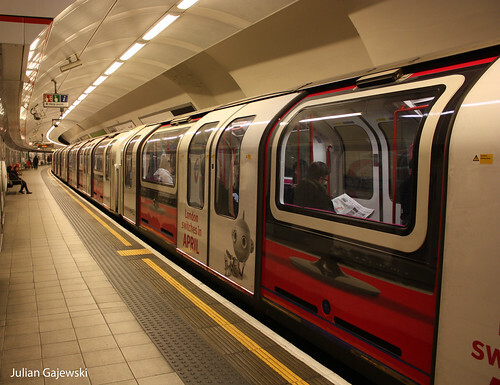 Mobile Marketing recently had a conversation with TfL's director of strategy and service development, Gareth Powell, who said that London Underground is on track to deliver wi-fi services at up to 120 stations before the 2012 London Olympics. 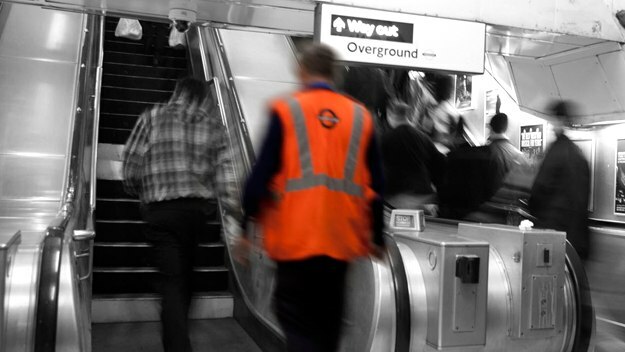 Wi-fi will be available on platforms, ticket offices and escalators, but not on Tube trains. As yet the cost of the service hasn't been set and will depend on which operator wins the contract to provide the service. According to the FT, Virgin has also bid for the contracts to provide WiFi services. Last month, it lost out to O2 in an auction to provide WiFi to Westminster council, but it is still participating in the contract to cover the London Underground. Cellular News said that there had been unconfirmed reports that China's Huawei would offer to build the network infrastructure for mobile coverage on the London Underground free as a "gift" from the former Olympic nation to the next. Apparently £50m worth of technology was offered, representing one third of the estimated £150m cost of the project. 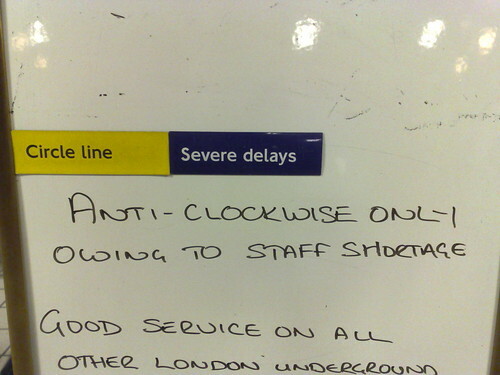 Genius new idea for a platform display on the Tube. We've all had those times when we've waited 15 or 20 minutes for a train. Then when the train eventually pulls in, the carriage right in front of you is packed & you have to squeeze yourself in, or wait for the next train, which could be just as full. Well Dan Taylor @fabricoffolly has designed a mock up of his fantasy Tube platform indicator "which would not only show you exactly where incoming trains were on the line (and update their progress in real time), but also which carriages were more or less crowded (achieved by sensing passenger body heat or possibly carriage weight, to account for all those suitcases). That way, you could increase your chances of boarding and the platform announcers wouldn't have to keep telling new arrivals to move along the platform." As Dan says "Go on TfL/CBS Outdoor - you've already got the screens..."
Taking inspiration from London Transport Museum's Sense and the City exhibition, Londonist & the museum challenged Londoners to stop a while and "sense the city". They asked for snapshots of a 'smart, connected and on the move' London: a city buzzing with activity 24 hours a day. 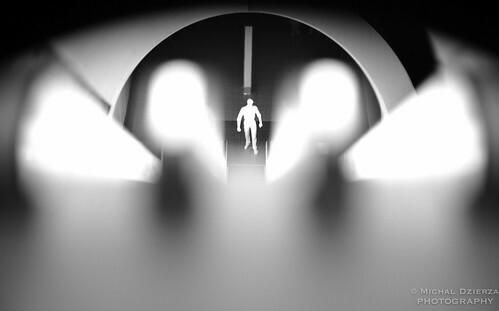 Over 650 images were submitted and fifty were shortlisted to go on display at London Transport Museum until March 18th. On Friday 20th January, three photographs were selected for special commendation by the competition's advisers: Clive Birch, Visiting Tutor on the Royal College of Art's Vehicle Design Programme and Johanna Empson, Talks and Events Programmer at the Photographers' Gallery. The great picture above by Danielle Houghton of Tube chatterers was one of the three commended. The fifty photographs will be on display in at London Transport Museum between 21 January - 18 March 2012. You can also see them on Londonist's website. 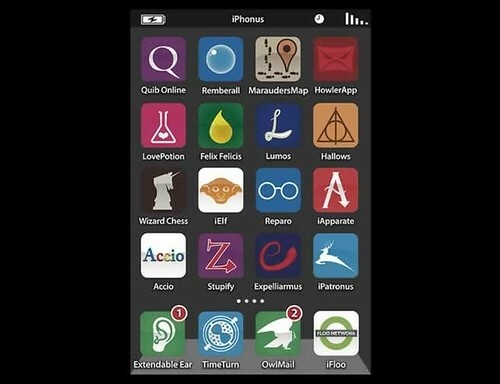 Someone's imagined what Harry Potter iPhone screen might look like and good to see that the sorcerer has an App that bears more than a passing resemblance to the London Underground Apps on the market. See the roundel in the bottom right hand corner. It's for the iFloo network. Geddit. Thanks to @Jemimah_Knight for alerting me to this on 9Gag's website - it's by or was at least found by the user tonypboy516. Harry probably has an Oyster card magic wand to wave at any Floo Networks to pay for his travels. With a flourish and a cry of Undergroundio he'd be zipping around in no time. 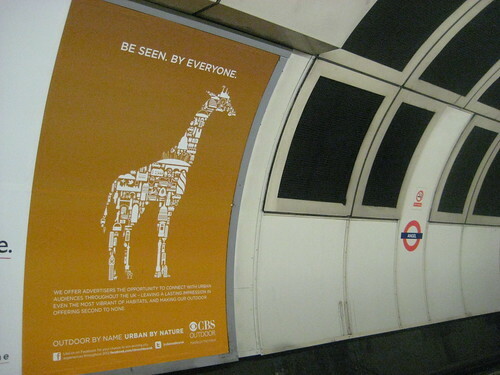 CBS Outdoor Tube Ad Campaign - "Urban by Nature" - Animals on the Underground, anyone? If you travel on the London Underground you can't have failed to see CBS Outdoor's (the guys responsible for placing ads across London Transport) poster campaign to promote the Tube as a great place for advertising. Their positioning is that they offer advertisers the opportunity to connect with urban audiences. The ads, which take the form of different animals made up of Londony urban landmarks and icons, apparently are "designed to articulate the importance of the urban audience and the fact that CBS Outdoor are best placed to engage with this valuable and hard to reach group of consumers". Not sure if it's just me but this kind of reminded me of Animals on the Underground - a whole collection of animals that could be "found" by looking in the Tube map! The campaign's only in London at the moment but from January 23rd you'll see it being rolled out to Manchester, Birmingham, Glasgow, Bristol and Liverpool. So there will be icons featuring Old Trafford Centre for Manchester, The Beatles for Liverpool and the Bullring Bull for Birmingham. The others will have region specific landmarks. If you visit www.facebook.com/cbsoutdooruk you can see all versions of the London posters. As a secondary element to the campaign they're offering people the chance to win city experiences throughout 2012 by liking them on Facebook & filling in a few extra details like age & region! If you think we have a lot of mice on the Tube (apparently, an estimated half a million mice live in the London Underground system), spare a thought for our friends across the pond in New York. NYC subway staff angered over what they say is a rat infestation in their workplace are holding a photo contest for the "nastiest" shot of a rodent, with a grand prize of a monthly travel pass. Commuters, who frequently see rats on subway platforms and tracks, are asked to upload photos to www.ratfreesubways.com, created by the city's largest transit union, Transport Workers Union Local 100. When visiting the "Rate my Rat" section of the site people can vote on the most repulsive vermin. "Who the hell wants to work around hundreds of freaking rats?" Jim Gannon, a TWU Local 100 spokesman, said in an interview with Reuters on Tuesday. "The union is calling for the Metropolitan Transportation Authority (MTA) to clean stations more regularly, place more trash cans on subway platforms, and repair holes in walls and floors. 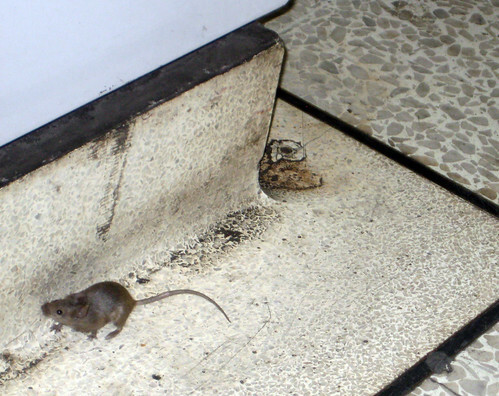 "The MTA defended its efforts, saying it routinely clears platforms and tracks of trash that would otherwise attract rats, deploys rodent-resistant trash cans in stations, baits nonpublic areas with poison, and reminds riders not to litter. "Even though rats are an age-old problem, more cleaners can only help," Kevin Ortiz, an MTA spokesman, said "We've enlisted WEP workers (job trainees) to clean stations and are working with the TWU to reduce labor costs so we can put more resources to vital work like cleaning stations and reducing the rat population." The MTA didn't comment on the union's claim that there had been a spike in rat infestations in recent months, saying it was difficult to measure rat populations. After spending two years building the company that is set to open up London Underground's disused Tube stations, Ajit Chambers of Old London Underground Company, has secured the support of 50 MP's and Ministers who have agreed to attend a site visit into a ‘Ghost Station’ and learn more about the project. Chambers says "The Mayor of London, Ministry of Defence and Transport Commissioner - Peter Hendy, have all been hugely helpful during the build of this project over the past two years and are now enabling MP’s and media teams access to visit one of the sites. TfL's Health and Safety Licensing have already facilitated access to Clapham South, Mayfair, Down Street and consideration to Brompton Road for previous visits by my project teams." 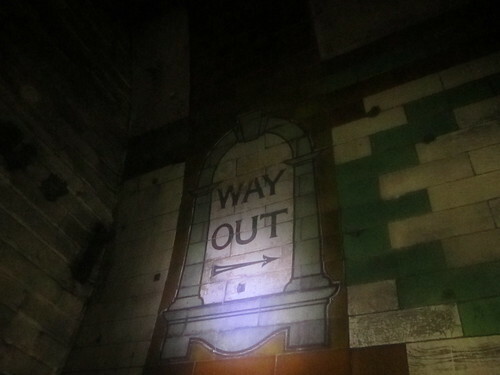 It's encouraging to see that MPs have just as much interest as a huge amount of Londoners in seeing the mysteries of these hidden stations and the visits should give them a first hand opportunity to see what is needed to re-open the stations & drive new income into the tourist industry. 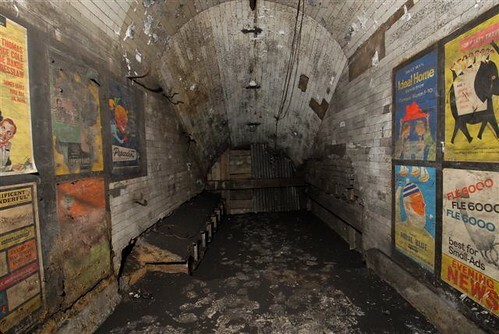 The multi-million pound public and private partnership is set to overhaul and adapt London’s disused Tube stations for a variety of cultural and leisure opportunities. It's hoped that this will create new employment across the city and quench the thirst for exploring hidden London for the rest of us. Ajit's project has already attracted interest from global news organisations including the BBC, Huffington Post, Bloomberg and most recently a Russian TV organisation with 120 million viewers has secured a site visit. Last year Chambers, received this pledge from the Mayor of London – Boris Johnson. "My pledge to you, is that we will do it if it doesn’t cost a penny of public money". The MPs site visit is a major step forward in getting Chambers the political backing he needs & help to secure even more private investment for the project. Had I stayed any longer, I doubtless would have been told that unattended luggage may be destroyed, that skateboarding is prohibited and possibly, that God is Love and The End is Nigh. Hasn’t London Underground ever heard of the wisdom of crowds? Don’t they know that humans are remarkably adept at sorting out difficult situations if officials just stop yelling instructions?" Secondly, the "mess" at Paddington on the the Hammersmith & City Line. "The Hammersmith & City station still has direct trains, but it is a diabolical place. There is only one proper ticket machine, which had a long queue when I arrived: my Oyster card, naturally, had chosen this moment to run out. I asked a station man where the ticket office was. “Downstairs,” he said. This was not quite what Shakespeare called “the lie direct” but it was what he called “the lie circumstantial”. The office is indeed downstairs but also several hundred yards away, at the other station. “You know this station is a disgrace,” I said to one of his colleagues as I finally stomped down the steps to the platform. “Well, funnily enough,” I said. “I might just do that...... Because the very next morning I had an appointment with Howard Collins, chief operating officer of London Underground." There's much other interesting stuff in the article with Engel's views on Tube fares & Boris & Ken "both are intent on using their high profile to ensure the Underground is never neglected again"; his meeting with a train driver (sorry), operator on the automated Jubilee line "mostly he sits there, arms folded on his lap, looking sagacious. “These are much better trains,” he insisted (a press officer was listening). “Having said that, I do like it when we have to drive them manually.” and visits Roding Valley the quietest station on the London Underground used by 200,000 passengers a year – as many as use Victoria each day. The FT article's not all doom and gloom, just about 90% of it, much like the Tube itself really. First Corporate names on Tube Map? 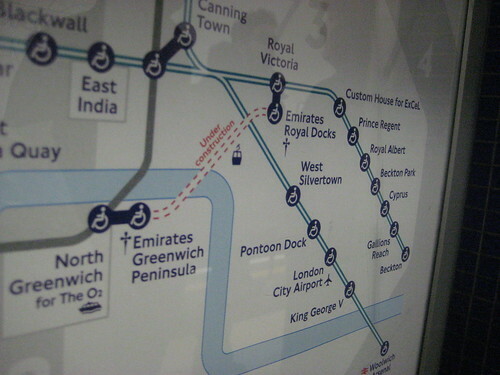 Is the Emirates Line for the cable car over the river the first time that stops on the Tube map have been named after a company? I was quite surprised to see these on the map and must admit that I only noticed it when @Jemimah_Knight and myself where sitting in a mock up of the cable car at London Transport Museum last weekend. The northernmost of the three steel pylons that will hold up the cables has already been completed. Once completed the cable car will move 2,500 people per hour (according to TfL figures) between North Greenwich and Royal Victoria. Or rather Emirates Greenwich Pennisula and Emirates Royal Docks. A lot of stations around the Docklands area have corporate names added to them, but this is more of a use to show which station to use for the arenas & exhibition centres around there. It's not as if Custom House (for ExCel) is called ExCel Custom House. However, as this is the first time (I think) a part of London's Transport infrastructure itself has been sponsored, it makes sense for the stops to be called after the sponsor. Or does it? How much money would a company need to pour into corporate sponsorship of station to get the station name changed, even if only temporarily? 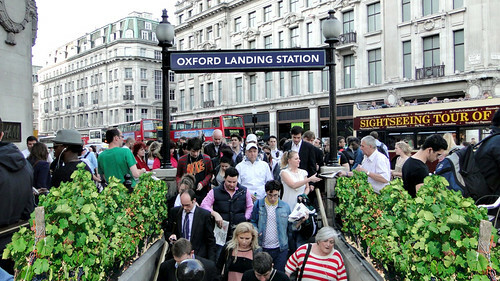 Last June, TfL were in discussions with a wine brand, Oxford Landing, who wanted to re-name Oxford Circus Tube and run "takeover" advertising throughout the station. The wine brand offered TfL a rather large amount of money in order to do this for a three month period over the summer but, TfL knocked back the idea. 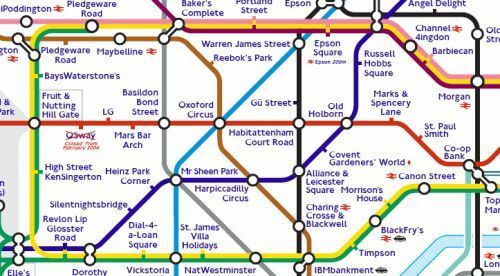 Perhaps the branded London Underground Map shouldn't be just a collection of puns of station names that sound like brands. Maybe in the future there could be a case for brands naming stations in return for a huge investment. What do you think? Main line railway stations seem to get away with it. On South West Trains I often go through stations that have "The home of rich estate agent" or "The home of large insurance company" on platform signs. 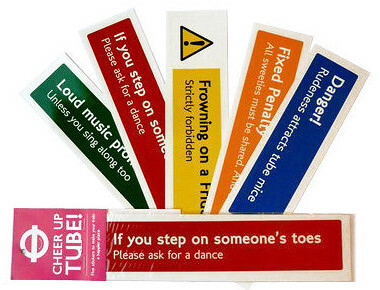 Should we have the same for the Tube? Would you welcome branded stations if the additional investment meant that fares weren't increased every year or there was an improvement to the service? Bumped into Greg who as far as I know is the only London Underground staff member with a Mohican and what a fine Mohican it is too. So thought I would make him the topic of my first "Guess Where Tube" of 2012. For new visitors unfamiliar with the "Guess Where Tube" game it's where I ask you to guess from exactly where on the London Underground, these pictures in the London Tube Flickr group were taken from. I have covered Greg on the blog before. But that was before I knew his name. Yesterday, I had a tiny chat with him before getting on the train that you see in the picture. 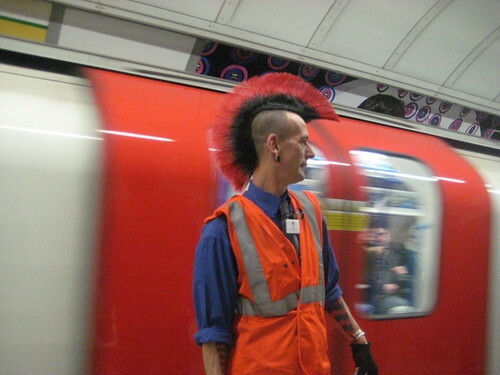 He's still happy to have photos taken and amazingly London Underground still let him get away with this haircut. "At least it's kind of in corporate colours", I joked. 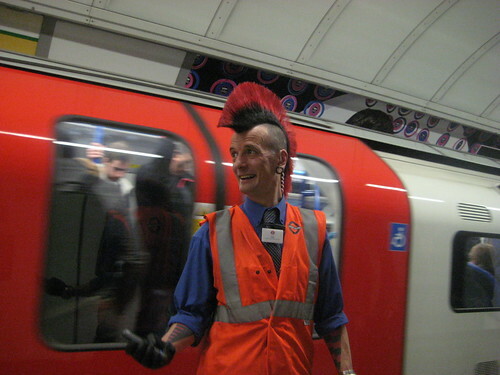 Previously Greg had explained his thoughts on having a Mohican on the Tube and said "London underground do have a Uniform Standard and for hair it states that it must be clean and tidy. I try to do my job well and to the best of my abilities, which may be why the management have not made any remarks about my hair. I get loads of comments from customers who love the haircut and kids are fascinated by it , best comment I heard from a child was "Mummy why was does that man look like a chicken" only problem was at the time I was assisting a mobility impaired cutomer and we were both desparately trying not to fall down laughing. It's nice to be an individual to be slighty different from the rest of the crowd especially when you have to wear a uniform. Next time you see me come say hello I don't bite." I did and he doesn't! 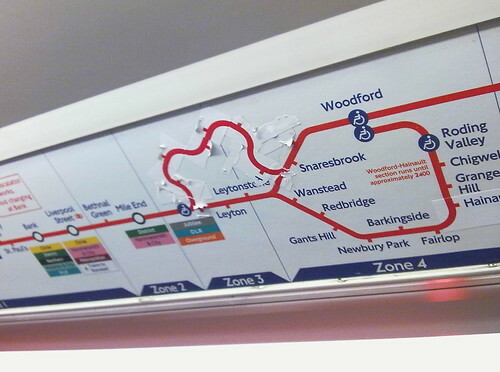 It's a mirror polished pocket Tube Map, so you can always check the look of your hair while travelling. As I think it's actually quite easy to get this right I'm only giving you until UK time 11.59pm on Monday 16th January 2012 to make guesses. Try not to look at the comments before you when making your guess. Make your guesses in the comments below and either leave your blog or twitter name or email address so I can get in touch with you if you're the lucky winner. Anyone who just enters as "Guest" with no means of identifying how to contact them, won't be included in the contest. The person who is the most exact will win & if there's more than one person who guesses the same most correct place, I'll put names into a randomizer & select from there. Have fun and thanks again to Greg for standing out from the crowd on the Tube. Why do Engineering Tube Trains have Girls' Names? I rarely get excited about pictures of London Underground trains. Well unless they're full of pink upholstery. That's because I'm a girl and girls aren't really supposed to like trainspotting or want to drive trains when they grow up. 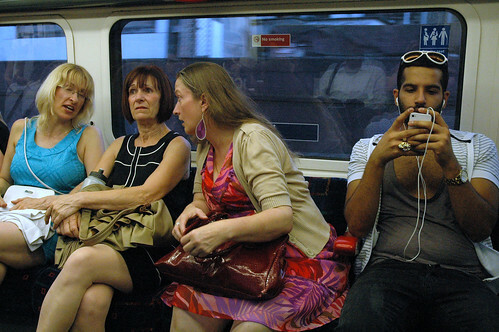 Admittedly a number of the women reading this blog probably are Tube drivers or want to drive one. 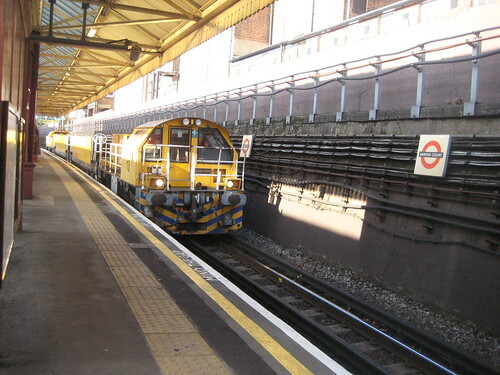 However, I did get snap happy seeing this yellow engineering train coming through Barons Court Tube station yesterday. I seriously have no idea what it does or why there were lots of little white steering wheels at intervals throughout the cars. I managed to see that they were called TransPlant, but that still left me none the wiser as to what that meant. I assume it's nothing to do with gardening or surgery. But I did note that it was named "Clementine", which was kind of sweet yet slightly puzzling. It got me thinking about why trains are often given women's names. 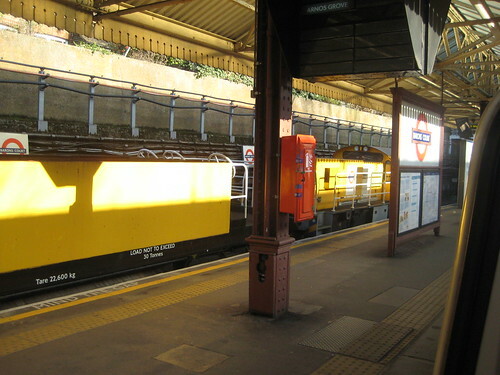 Even fairly ugly yellow engineering trains which should probably have names like "DustBuster" or "Transplanter" or "Burt" or "Brad" or something equally butch, are still given pretty names like "Clementine". As the train left I could see the car on the back was called "Denise" so I reckon that each car was given its own female name. Anyone know why trains are often named after women? Also if you do know what this TransPlant thing actually does I'd love to hear. Are these cleaning Tubes - Big Yellow Duster or something else? 30,000 London Underground staff are having site visits of the Olympic Park over the next six months in a bid to familiarise them with the games. Heart.fm have reported that this will cost £2.5 million pounds and transport critics are already doubting the value. One does wonder what sort of a tour they are getting that will cost two and half million quid. Will Seb Coe be personally leading the guided tour? Is Chris Hoy showing them the best way to carry Brompton bikes onto the Tube? The mind boggles. "London’s Transport Commissioner, Peter Hendy said: "This is a big year for London and TfL, with the Diamond Jubilee, 2012 Games and a huge programme of investment, while also continuing to improve the journeys of millions of customers every day. Every member of our 30,000 staff will play an important role in achieving the significant and unique challenges ahead. It is vital that we train all of our staff and explain what is expected of them in 2012, and beyond, to deliver the best possible service to our customers." - The entire programme cost is £2.5m, of which TfL is funding £1m. The ODA (Olympic Development Authority) is contributing the remainder of the cost. This works out to £33 per head of TfL money. - More than half of the cost is towards the hire and running of the venue for six months – 3 sessions a day to enable TfL to reach all 30,000 members of staff. A number of staff who read my blog have already said their dates have been allocated and some have promised to report back to me on what the visits are like. I'll be most interested to see. 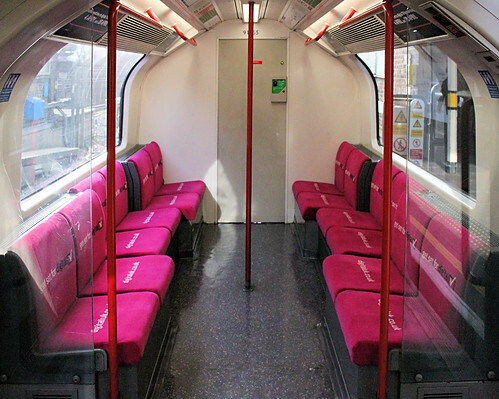 From 9th January 2012 a pink seated London Underground train will be travelling for 3 months on the Central Line to promote London's impending switchover to digital TV. The Tube train (1992 stock for those who care - train 91063+91055 to be even more specific) entered service, with the switchover message on every door and features windows that form TV screens. 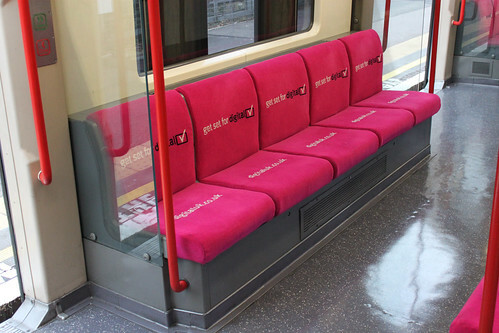 All seats on the train have been given pink "moquette" to further support the initiative. Deborah Bain, London manager for Digital UK, said: "There are now less than three months to prepare for switchover. This is an exciting change affecting millions of viewers and we're doing everything we can to avoid people facing a blank screen." Some of the seats even had little soft toys on them with the Digital switchover mascot. London Underground rarely have branding where the whole train is taken over. 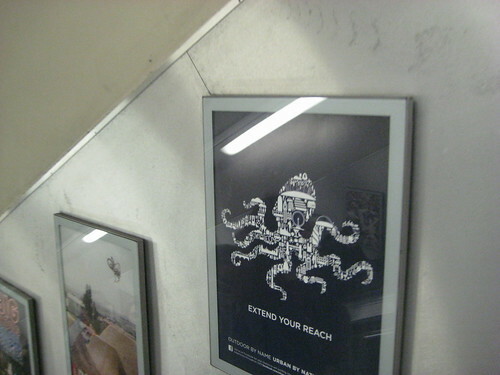 There was some on the Piccadilly Line to promote Platform for Art in 2007. 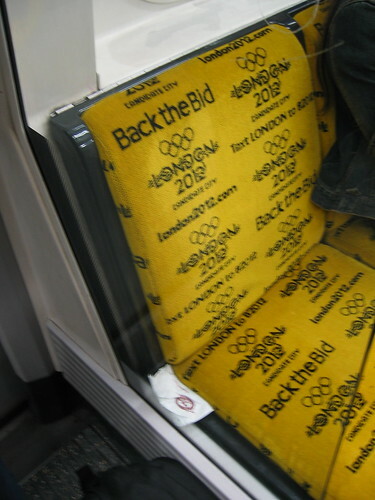 However, the most eyecatching was for 2004's promotion to "Back The Bid" for the 2012 Olympics. This was when London was only a candidate city, so quite a bit of expense to try to prove we were a city worth giving the Olympics to. Looks like it worked though, even though experience on the Tube during the 2012 Olympics certainly won't be worth an award.